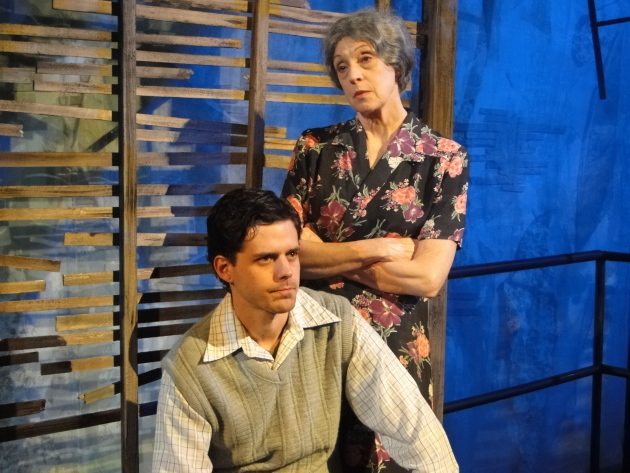 The Glass Menagerie is the final play in Yellow Tree Theatre's fourth season, and it's a great conclusion to an entertaining season. 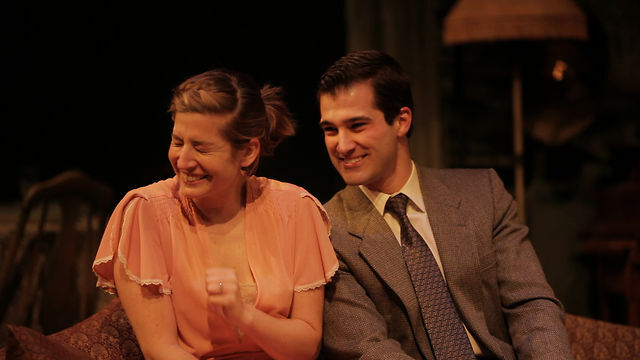 Written by one of the greatest American playwrights (and one of my favorites), Tennessee Williams, this play is a nice choice for Yellow Tree and fits their intimate style and space very well. The Wingfield family's dysfunctions feel very real and close as you sit just a few feet away from the action. 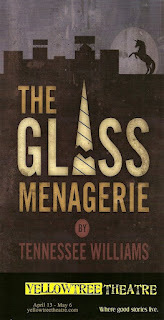 The Glass Menagerie has long been one of my favorite plays. It's a self-described "memory play" in which one of the main characters, Tom, introduces and narrates the action, as well as taking part in it. He has several soliloquies, filled with such beautiful language: "Yes, I have tricks in my pockets, I have things up my sleeve. But I am the opposite of a stage magician. He gives you illusion that has the appearance of truth. I give you truth in the pleasant disguise of illusion." Such is theater - truth in the disguise of illusion. Of all Williams' plays, this is the one that contains the most truths about his life and his past. Perhaps that's why it's so bittersweet. A mother and her two adult children live in a small apartment in St. Louis in the late 1930s. Tom dutifully supports the family by working at a shoe factory, where he feels stifled and bored with life. Laura has a slight physical impairment that has caused her to become reclusive, wanting nothing more than to stay in the apartment, listen to records on the Victrola, and arrange her glass figurines, her menagerie. Their mother, Amanda, is constantly nagging her children - telling Tom how to chew his food and how to sit at the table, cajoling Laura into leaving the house to attend business school or entertain a "gentleman caller." She's a stereotypical fading Southern belle, who talks constantly of her glorious past and happy youth; she performs a memory play of her own for her children. She wants Laura to be as popular as she was, but Laura is nothing like her, and the time and place they live in is nothing like the one in which she came of age. 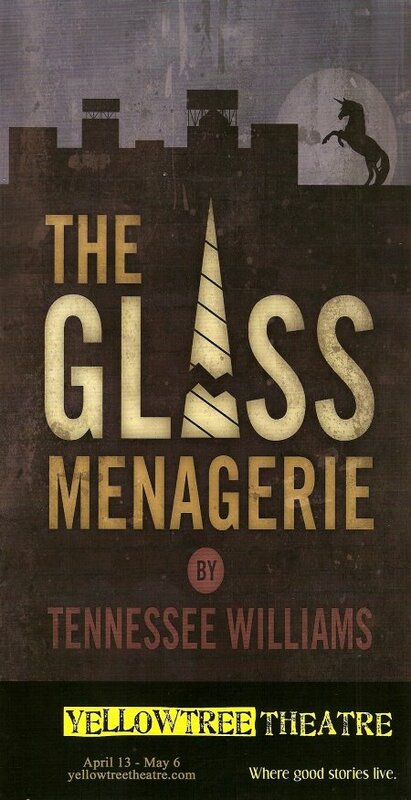 The situation turns tragic as the gentleman caller experiment fails miserably, Tom leaves the family to find his fortune in the world, and Laura is left with her glass menagerie. Noted Twin Cities director Jon Cranney brings out the best in this fantastic four-person cast. Katherine Ferrand plays Amanda Wingfield, one of the greatest roles in American theater, and she knocks it out of the park. She's always talking, always fluttering about, telling endless stories, with lots of energy hiding a deep sense of desperation (like many of Williams' women). Katherine's sharp performance alone is worth the trip to Osseo! Yellow Tree Artistic Director Jason Peterson plays Tom, another great role. He speaks in memory-tinged melancholy as he narrates the scenes, with quietly controlled anger and restlessness in the scenes with his family. I was curious to see Carolyn Trapskin as Laura because her previous roles at Yellow Tree have been so crazy and over-the-top; this is a much more internal character than I've seen her play before, and she does it very well. Laura always breaks my heart, perhaps because I find myself relating to her, and this production is no exception. Finally, Josef Buchel is everything you want the gentleman caller to be - bright and charming, friendly and talkative with everyone he meets, but hiding an insecurity and uncertainty with life. Part of the tragedy is that Jim and Laura really do get along well, and she's able to open up to him somewhat, making them (and us) believe that things could have gone differently if the situation were different. But there are no happy endings with Tennessee Williams, only deep explorations of family, relationships, and societal bonds. The stage at Yellow Tree is tiny, but they always seem to transform it into what's needed. This time the set (by Jeffrey Petersen) is a somewhat shabby but homey little apartment, with sloping wood floors and a small dining room separated by a curtain from the main living area, sparsely decorated with photos and mementos. I don't usually comment on (or notice) the lighting, but the candlelight scenes with Jim and Laura were beautifully done (lighting by Paola Rodriguez); it felt as if we were watching an intimate moment play out in the soft glow of candles. Yellow Tree Theatre has recently announced their new season and it looks like another great one. I'm most excited to see Circle Mirror Transformation, a great character piece I saw at the Guthrie studio a few years ago which should be a great fit for Yellow Tree - intimate, funny, poignant, and full of awkward pauses and weird acting class exercises. And of course, nothing piques my interest like the words "new original musical," especially when the authors are one of my favorite local musicians, Blake Thomas, along with great Yellow Tree actors Mary Fox and Andy Frye. So if you missed out on this production (only two more performances, sorry for the late review), you have some great choices next season to visit Yellow Tree Theatre in charming Osseo, where good stories live. Her glass figurines is my inspiration in creating unique glass kitchen splashbacks. I always loved how the characters act in during their show because they are truly graceful. Probably one reason why this production is appealing in its form may be the fact that it is almost lifted from Mr. Williams' own persona. Makes you want to do some self-reflection yourself, too.